Hundreds of Hurricane Evacuees Remain in Mass. Families displaced by the devastating hurricanes last year are continuing to pick up the pieces in Massachusetts. And another hurricane season could wreak further havoc in Puerto Rico. Hurricane season officially begins in just one week, but across Massachusetts, hundreds of families are still picking up the pieces from last year. Crystal D’Abbraccio, her husband, and two kids are doing just that. The D’Abbraccio family lost everything on St. John eight months ago in Hurricane Irma. Today, they are still waiting to move home. Since the fall, the Lexington native and her family have been living with her parents in Concord. They rented in the Virgin Islands before Irma, carrying no insurance. “How do you even begin to afford to buy all the stuff to fill a house for a family of four again? Like, how do you do that? Pots, pans, dishes, towel, sheets. It’s hard to think how we could even make that happen,” she explains. Puerto Ricans living in Massachusetts after Hurricane Maria are facing similar challenges. 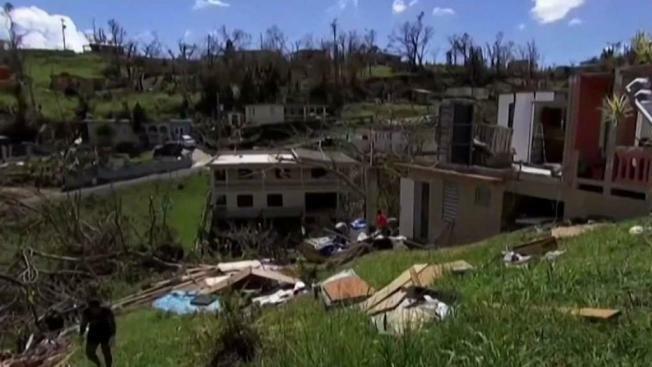 “They are probably now the single largest driver of demographic growth in the Commonwealth in 2018,” says Juan Carlos Morales, the Chairman of Massachusetts United for Puerto Rico, a fund that has raised $4 million for storm victims moving to the Bay State. So far, Morales estimates five to ten thousand Puerto Ricans have moved to Massachusetts after Maria, but that number could double this year as the island continues to struggle. “It is more likely than not that it’ll collapse again in the next 6-12 months in the middle of hurricane season and that will further increase the number of self-evacuees that come to the Commonwealth,” he says of the situation in Puerto Rico. Many of the Puerto Rican evacuees have moved to parts of Western and Central Massachusetts, including Holyoke. The Holyoke school district says after the storm it enrolled 245 new Puerto Rican students. As the new hurricane season starts, 174 remain enrolled. A handful of students have gone back to the island, only to then return to Western Massachusetts after learning the situation back home had not improved. Holyoke has hired some teachers to deal with the influx of students, including some also displaced from Puerto Rico. It’s hard to know how many more students may show up for the start of the next school year, but officials say they are used to students arriving from the island even without hurricanes causing damage. It’s part of what’s described as ‘circular migration’ between family in Western Massachusetts and the island itself. Still, through the uncertainty for these students and families comes determination. “Every three months I go back I’m blown away by the progress every single time,” D’Abbraccio says of the gradual improvements in the U.S. Virgin Islands. D’Abbraccio wants to contribute to St. John’s progress. She has been making plans to re-open her storm battered business on the island later this year, even if she can’t yet move back.